Are your missing teeth wreaking havoc on your daily life? Do you often find yourself struggling to eat your favorite foods or hiding your smile in photos? You deserve to have a beautiful, complete smile that you love to show off! Our team creates advanced, custom dentures to give you full smile that doesn’t interfere with your activities and passions! Our traditional full dentures are intricately designed to fit snugly along the gumline. In addition to their custom fit, we also provide extra-strength denture adhesives to keep it in place. Since partial dentures are only replacing some of the teeth and not the entire arch, they use a wire apparatus to discreetly attach to existing teeth for additional support. Implants are small, titanium posts that are surgically placed into the jawbone. They create a stable, permanent foundation for replacement teeth to connect to on top. Many patients struggle with uncomfortable, ill-fitting dentures and implants are sometimes the perfect solution. With the help of anywhere from four to eight implants, a denture can easily snap onto them. Once the denture is securely attached, it won’t move or budge for the rest of the day. There are a variety of tooth replacement options and it’s important to attend an in-person consultation to learn more about your oral health, unique needs, and more. 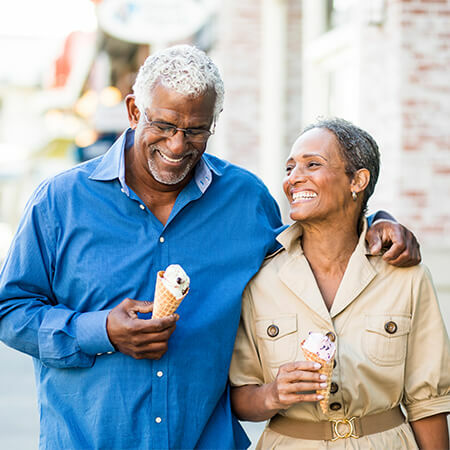 Many people are good candidates for dentures, but we’ll always go over every option so that you can make a well-informed decision based on your specific needs, lifestyle, and budget! What is the denture procedure? We’ll take impressions of your gums as well as any existing teeth you may have to create a custom mold for your dentures. Then, we’ll discuss what you want your replacement teeth to look like and map out your new smile using our state-of-the-art smile preview software. We’ll send all of this information to our high-end, off-site lab where they’ll fabricate your dentures and send them back for their first fitting. Bacteria can collect on your dentures just as they would on your natural teeth. To prevent gum disease and other oral health issues, we recommend soaking your dentures in a denture-safe solution every night. You can also gently clean them with a toothbrush. After you get your dentures at our office, we’ll send you home with a detailed set of care instructions to help you preserve your dentures.